If you follow my Instagram stories at all (and you totally should! 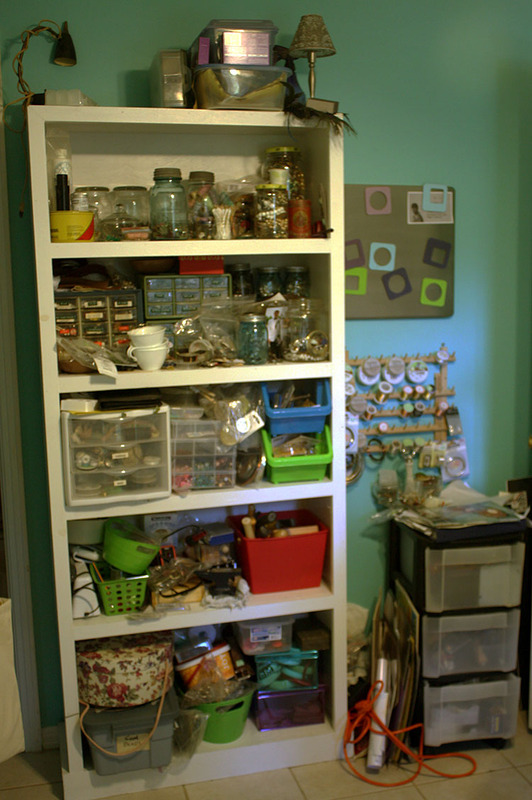 ), you may have seen that I'm in the process of organizing and cleaning the craft room. I started on Sunday or Monday (it's all a blur now), and I'm still not done. It's been goo though, the sorting and purging even inspired yesterday's reflections on creativity. In any case, here's a peek at how it's coming along. 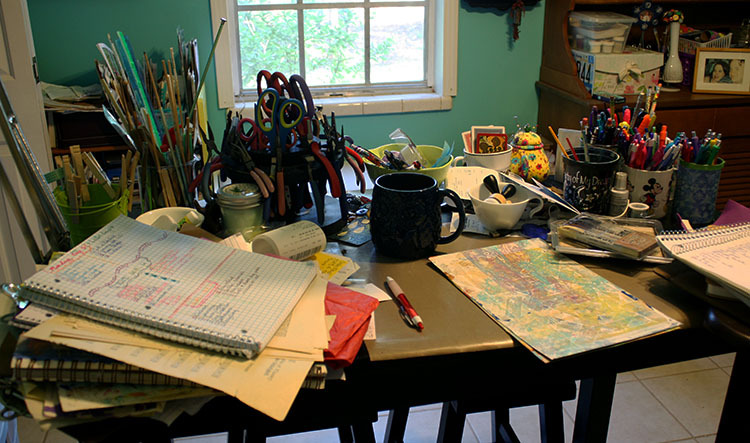 Let's start with my craft desk and the admittance that the entire room was in similar disarray, hence the desperate need for organization. The before of that hutch gave me spasms. You better be thankful that I don't have any pictures of that horror. The closet is much better now that I've added some more storage space. I didn't touch the top shelf. It is what it is. These pictures were shot on Wednesday. Since then, I've actually cleaned my desktop. This bookshelf is really all that remains to be tackled. It's a HUGE job. There's all kinds of tiny bits and pieces stashed in there. I'm hoping to get to it today. Say a prayer for me! Ever since the move, I've had the hardest time getting this room in a work-able condition. Pat's had the same problem with his office (hence the box room). We've concluded that when we moved into our previous house, we had little to nothing. 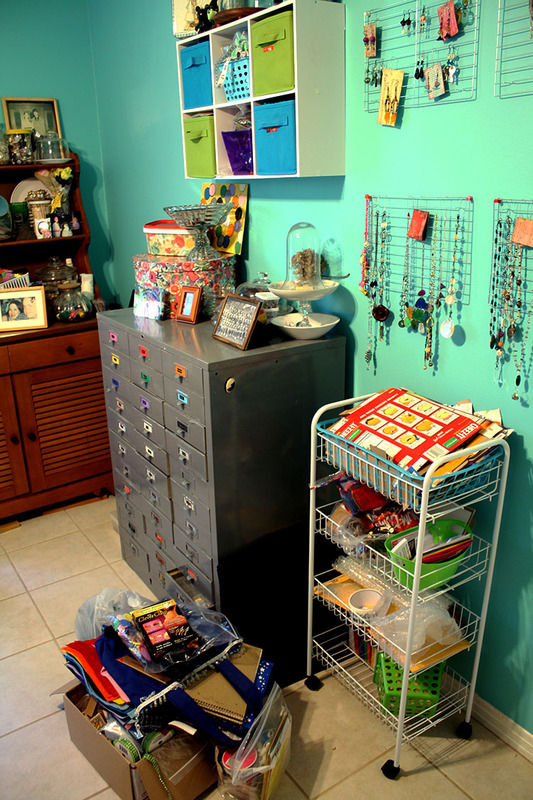 Over time, we bought and collected and built more items for these spaces, slowly adding them in little by little. When we began to pack for the move to this house, we tried to purge some of the junk. However, the bulk of it came with us. Since we're not slowly moving these items in, it's harder to incorporate it all. 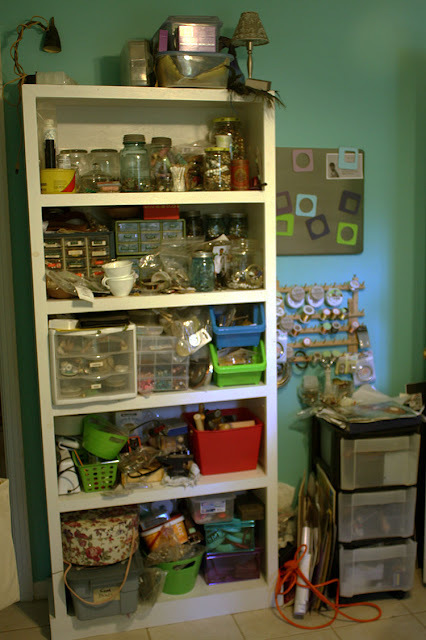 This time I'm not adding a single strand of beads or a new book to my supplies, I'm trying to put them ALL in the space. It's so much harder. We hope to get it all worked out eventually, but I think purges like this one may be necessary to get there. 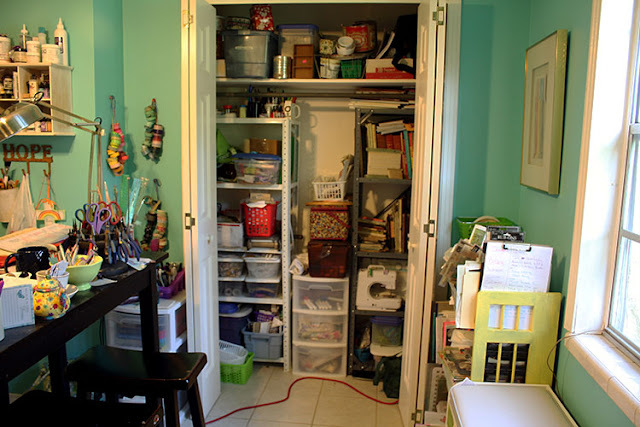 How have you coped with moving your stash from one space to another? 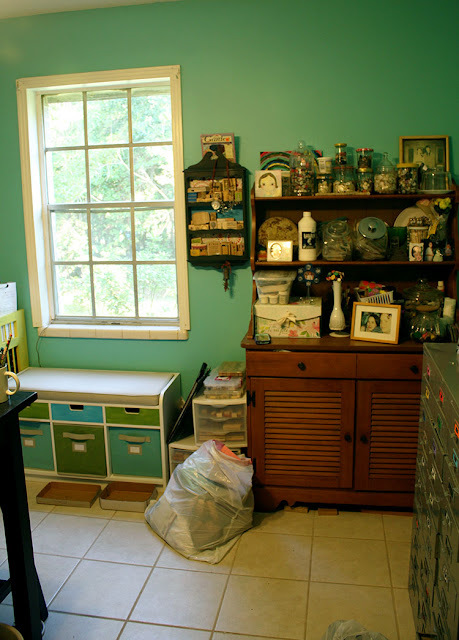 Did you struggle to get it organized and make it work? How long did it take you? I didn't really have a lot when we moved into this house. I would hate to have to move all my stash now. I think there is no better way to get creatively fired up than to reorganize your stuff, aren't you just dying to get in there now and play with your goodies, and I bet you had fun discovering things you forgot about...I need to get busy! Oh yes, best of luck on getting it all to work. Most of the craft books didn't come into the new craft room. We're working on having some remodeling done in another room and then add some bookshelves, so those are all still in boxes. Oh, it's such a headache. I can't wait to have a perfectly unpacked house! Eek.